Super fun Mutual activity! We did this as an all-girls activity. I mixed up the teams so that there were multiple ages on each team. The girls had a great time! We did a series of 5 challenges. The rules were “no law-breaking” (no speeding, must wear seat belts, etc), “be courteous at any home you visit,” and “no cheating or sabotaging other teams”. The winning team would be the first team to have every team member cross the finish line (tape on the floor). Our mutual ends at 8:30, so I asked that even if they weren’t done with all of the challenges, they return to the church no later than 8:20. Any team arriving at the finish line after 8:25 would be disqualified. Each team had an adult leader/parent driver who took them from site to site in their vehicle handed out the next challenge envelopes as challenges were completed. After each challenge, they got a new challenge envelope with a new location & assignment. I used plain envelopes marked with the challenge numbers in their team color. Each team leader (adult) got a clipboard with the envelopes attached. 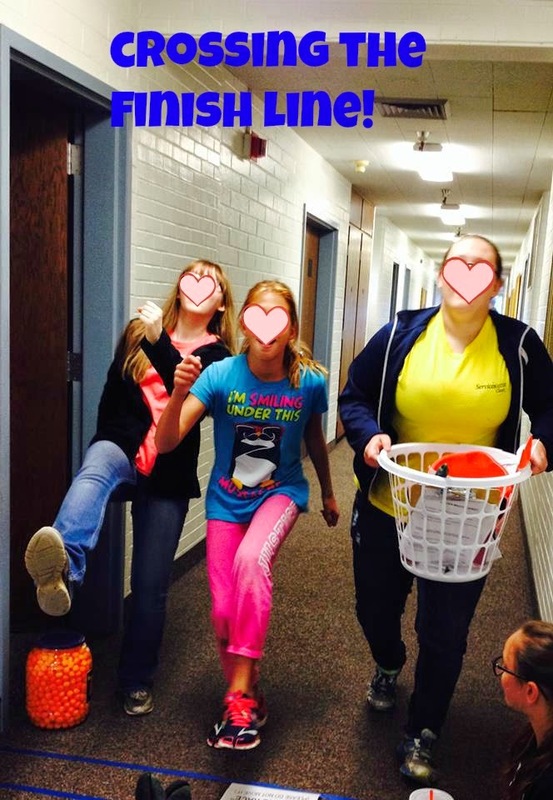 Each team also had a laundry basket of supplies that they carried with them. We asked them to take group photos as each challenge was completed. We had a ward boundary change last year, so since some of the services that we would be doing we would be to families in our ward area, I tried to include a good mix of people from throughout the ward (some people they might not know, some people they do know, people who serve in leadership positions, less-active or part-member families, etc). I asked around the ward for volunteers with weeds in their yards (not a problem finding those!) and asked specific families who I knew didn’t have food allergy issues if they would let us bring them a meal for the meal-delivery challenge. CHALLENGE 1- “WEEDS”: went to a nearby home (pre-arranged) and pulled a bucket full of weeds. They had to share tools & gloves & use the bucket we provided. We had each team go to a different home so they couldn’t tell which team was “ahead”. CHALLENGE 2- “CHANGE”: they got an index card (with 4 quarters taped to it) inside their envelope for the challenge (the cards said “please enjoy this random act of free $”). The assignment was to go to a nearby grocery store and tape the card (using the tape in the basket) to a vending machine. CHALLENGE 3- “WRITE”: went back to the church and found a greeting card taped to the wall of the overflow room. Pens were provided on site, and each team member had to write or draw something on the card (we did ours for a YW who is out of town for a while, but could do a card for a missionary). Next team to arrive at this challenge site could not start until the previous team was finished. CHALLENGE 4- “BITE”: went to church kitchen, found a bag in the fridge (marked with their team color). Followed the instructions to assemble a freezer meal using the provided gallon freezer zip-lock bag and ingredients (they did teriyaki chicken: frozen chicken breasts, a bottle of teriyaki sauce, 1/2 chopped onion, 1 bag frozen broccoli/cauliflower). Then they delivered their meal (and cooking instructions) to a (pre-arranged) family in the ward (again, we had each team go to a different home so that one family didn’t get over-run by teriyaki chicken). CHALLENGE 5- “TRASHY”: go out in the church parking lot and have each team member pick up 2 pieces of trash and put them in the trash bag before racing to the final finish line (ours was at the family history center). I knew this would be a tough one, since there is never any trash in our parking lot, so in tiny letters at the bottom of the challenge, I wrote “If you have followed directions and read this entire challenge before starting to pick up trash, you can skip the trash pick-up and head straight to the finish line” – All of our teams started to head out to pick up the trash, but caught themselves in time! They were hamming it up a bit! In the corner you can see the coveted prize – a giant tub of cheese balls! I had actually planned on doing several more challenges, but I panicked and decided to cut some of them at the last minute because I was worried that the girls wouldn’t be done in time. Boy, was I wrong. Our first team came back after only 25 minutes! The next teams were around 30 minutes and 35 minutes. I was shocked how quickly they finished. So if you want your activity to run longer, you probably want to add a few more challenges. One of the challenges I “cut” was making little gift baskets – mustache themed “stash” of snacks for the bishop (my idea was that one team would make a drink basket (bottled water, juice), one would make a sweets basket (candy), and the other would make a savory snack basket (jerky, chips). And then they would deliver their baskets wearing mustaches, of course. I got the idea for this here and adapted it. 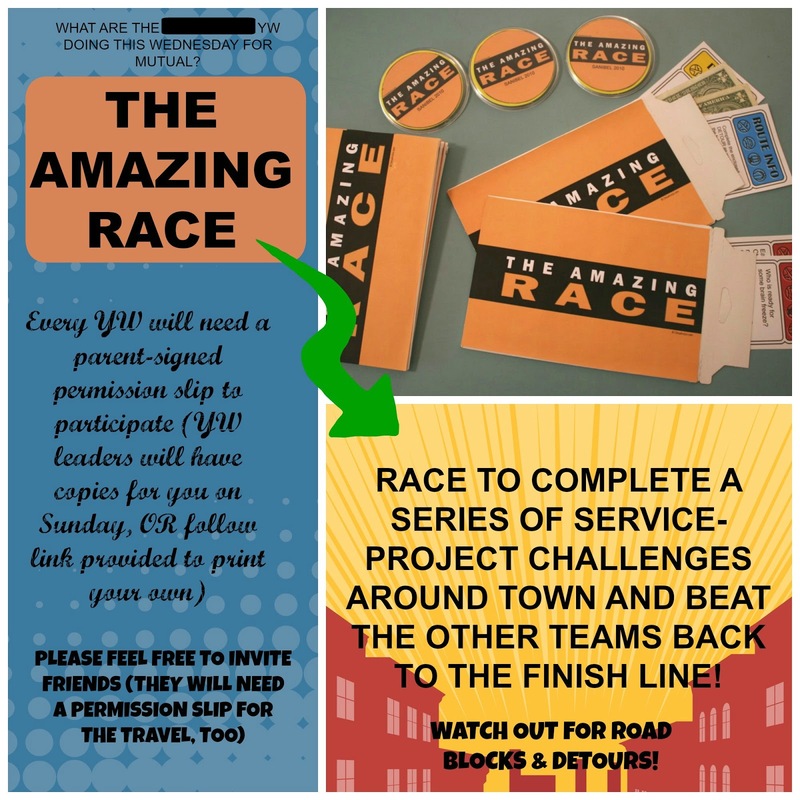 You could also do “road blocks” and “detours” like on the Amazing Race tv show (also got cut at the last minute in our version!) but that would add some time to the activity as well. BONUS: The girls didn’t know this (because they were having too much fun) but in addition to doing service, they also learned some valuable skills (weed-pulling, meal preparation, etc). I hope that it also helped build unity in the ward because the YW got to meet new people in the ward and the ward members saw the YW out serving in the community.